what the name of Jesus means to us personally. I originally wanted to write to you about two messages: about the Grace of God, and about coming closer to Jesus is while here on Earth. These are beautiful messages, but when I started to write it out, the words just didn’t sound right. Now I realize that this painting needs no explanation, rather it has grown to become one of the most personal and sacred pieces of art to me. To look at it is like looking at a window to my own soul right now. That’s a frightening thought, because my art is always subject to criticism, and to open my heart up to the public like that would put my heart on display for criticism as well. But at the same time I know that I painted this for you. Yes, you. And so I need to give you the gift of my heart. This painting doesn’t require any real words because it is something that can only be felt in your heart and not explained. When I painted this piece, all I felt was a fire blazing bright within my soul. It is an indescribable feeling, and it is a fire of love I have for the Lord my God. To me Jesus Christ means love. His love is uncompromising, understanding, unconditional, and eternal. This kind of love is beyond human comprehension, but it can only be felt. I know that Christ will dwell with any soul who seeks after Him, and when they find Him they will find peace and comfort in their own hearts, as He has greatly comforted mine. I’d like to share with you two songs that express the feelings I have for this piece. The past two artworks I’ve shared wordless songs. I find it interesting that though I’ve had so much trouble completely expressing my thoughts of this piece, I am sharing music that has the words I cannot find. Lastly, I want to express my sincere thanks to the people that made this painting possible (This seriously has been a group effort for this painting to happen! ):To Christine Simmons, as always, for helping me see my vision in picture format, and teaching me about Grace. The offering we give is enough to God. To Brent Alvord, the best hands out there! Thank you for continuing to be my Jesus hands. A special thanks to Kendra Latauska, as the woman in Familiar Grace. You brought the sweetest of spirits to this painting, and it was a delight to get to know you better both in person and on paper. To all the most generous women who watched my two children so I could work on this painting: Karin, Catalina, Diana, Patricia, Jana, and Karla. 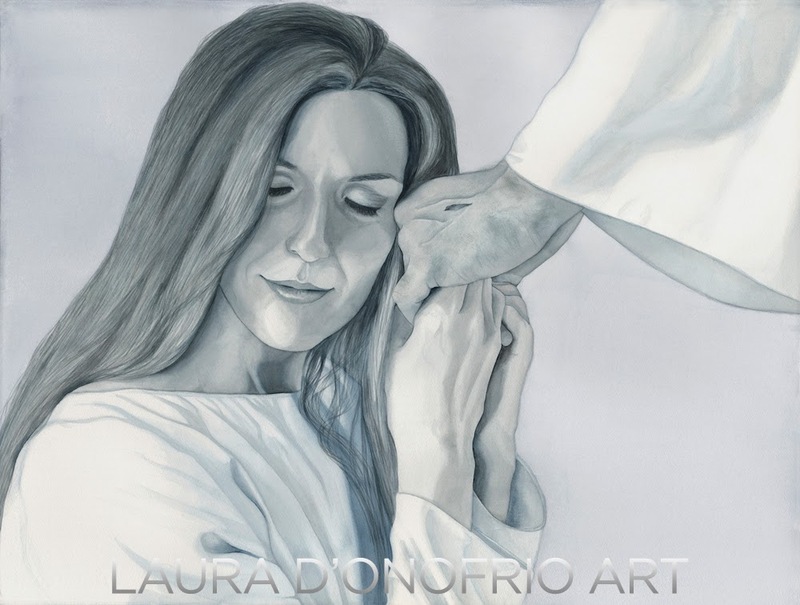 I could not have painted this beautiful piece without you, and you have my deepest gratitude for allowing me to finish it so I can share it with everyone on Easter. Previous PostConnecticut Watercolor Society Member!